Who loves cheap fabric? Um, silly question ... I know!! It makes my day when I'm perusing the fabric store for on-sale fabrics. My local fabric shop often have a discount for end-of-bolt fabrics, and they also have a sale table of fabrics. That's my go-to section as soon as I enter the fabric shop .... cough ... not that I'm ever distracted by anything except what I went in there for, huh!! 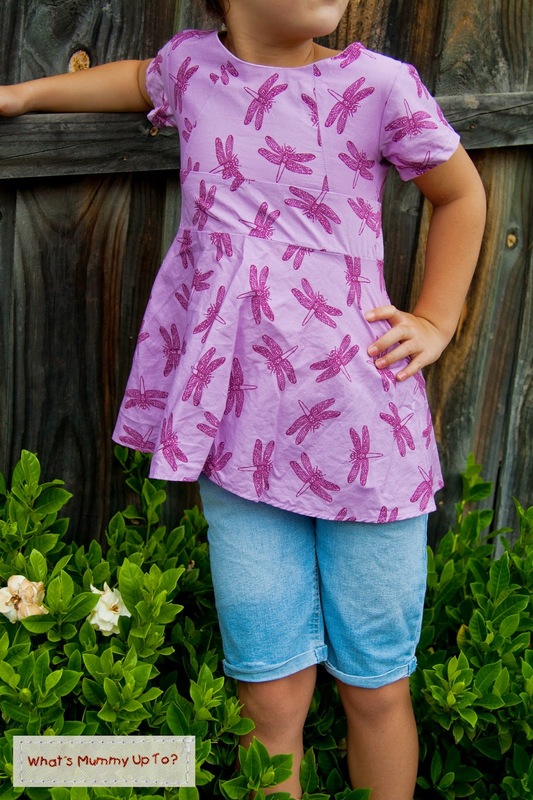 Anyway, one particular day a couple of months ago this happened, and I picked up this adorable purple dragonfly fabric. There was just a smidge over 1 metre left on the bolt, and I picked it up for $4. Pretty happy with that. This one didn't even make it into my stash. 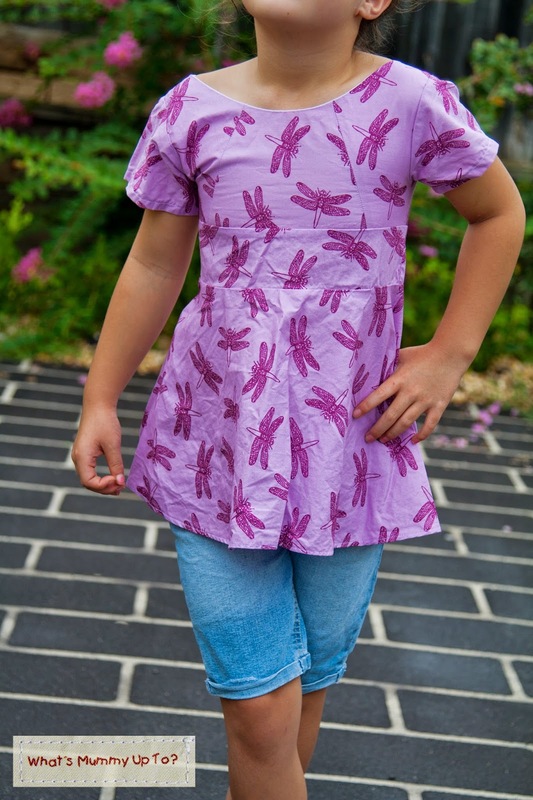 It was sewn up immediately into a gorgeous little Rainbow Pieced Peplum using this amazing pattern from Shwin and Shwin. These girls are very clever and creative, and have a whole bunch of free patterns too, most of which are in my to-do file. They're very generous. Anyway, I love the bodice on this, and this was my first peplum, so I learned a new skill there too ... love a fun project with a new skills as well. I also adore the exposed zip, and this was one step in my effort to cure my zip-phobia. I have to say I was not overly happy with my zip placement and technique, but at this point I'm seeing every zip as one step towards a better one, so off I go. Oh, and sorry about how crushed the top is in these pics ... straight from the washing line and all that! Never was a keen ironer! Bethany loves this top, and she always gets so many lovely comments from people whenever she wears it. That's a win right there. Another win is when you have two munchkins small enough to get two outfits from 1 metre of fabric. Yep, Hannah's just started pre-school, and really needed some pre-school clothes. OK, I really needed an excuse to make her some new clothes to wear to pre-school. 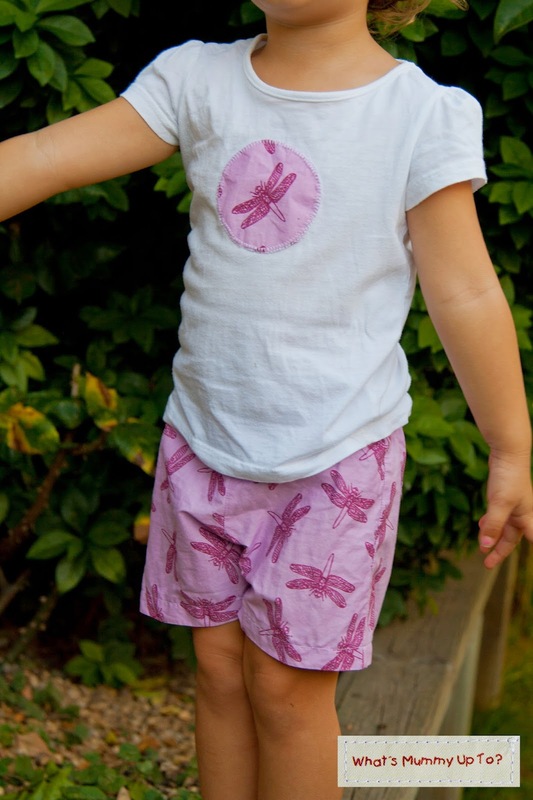 These little dragon flies are so adorable, they basically begged to be a little matching set. 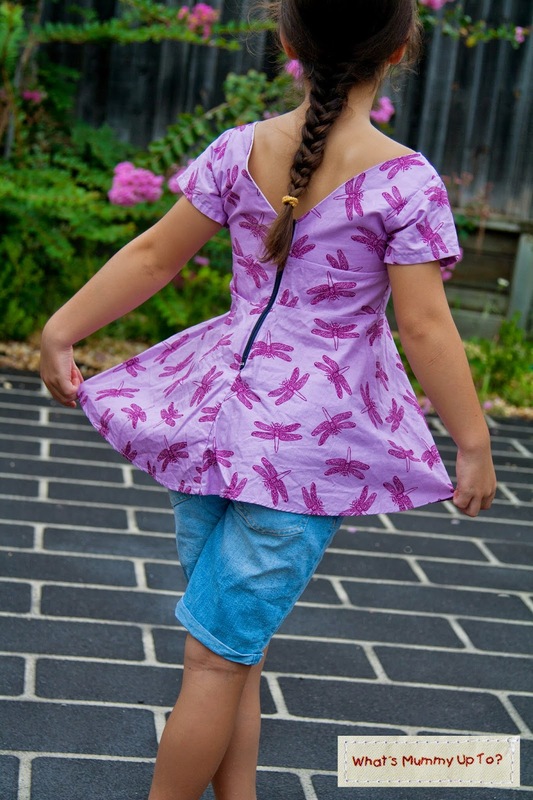 I had just enough fabric left to make this pair of basic shorts from my go-to shorts pattern, the Kids Shorts from Dana at Made. 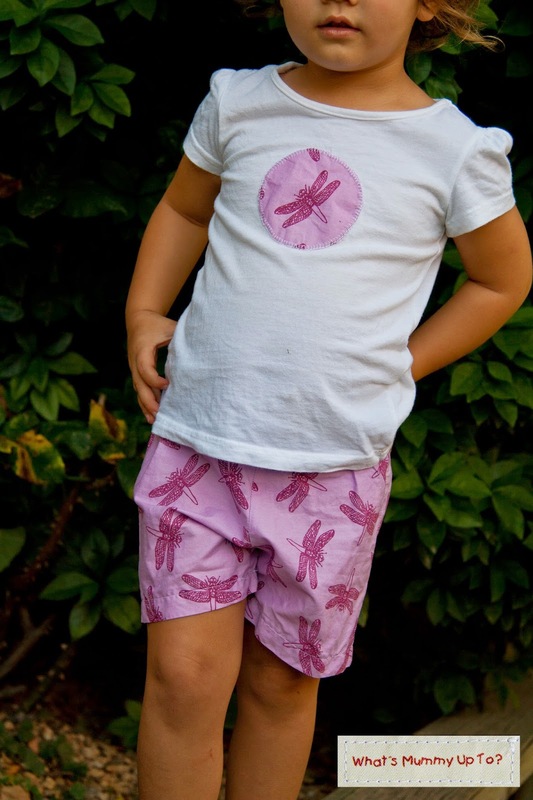 I used a coffee mug and traced around it to cut a single dragonfly to applique onto a store-bought T-shirt. I even got to play with the blanket-stitch on my new sewing machine. It's so fun to have some handy and easy-to-use stitches to play with, and it really makes an applique look so much better than the tiny zig-zag stitch I used to use on my old machine ... sigh ... I'm still mourning the loss of my lovely old Pfaff. Anyway, fun new-machine functions like this are easing the pain. 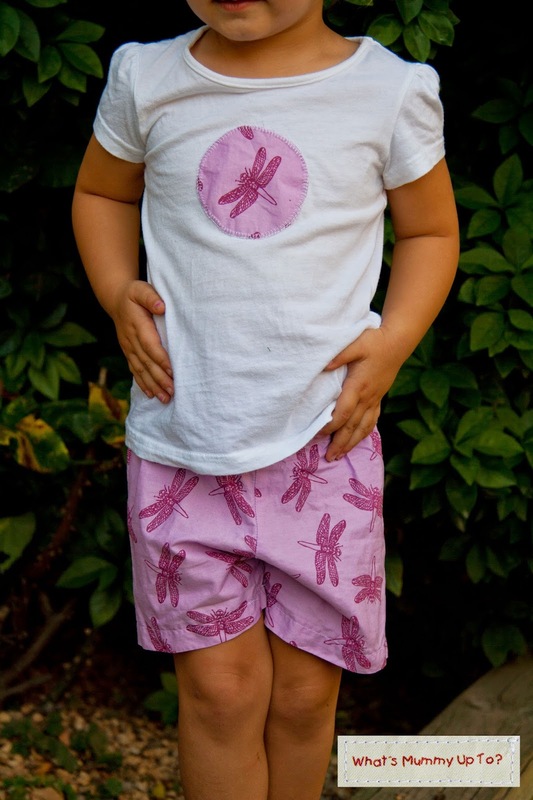 Oh, and I made the shorts a little extra-spesh by adding back pockets, with a centred dragon-fly on each. I like how they turned out, and she's worn this outfit a few times already to pre-school. Comfy and not too fussy for sand-pits and painting, but still fun and girly for my little usually-only-wears-dresses girl. And that's it. Cute, cheap fabric all gone, an afternoon of fun sewing done, and two new outfits for my favourite girls. I used to mourn a little when the last scrap of a fave fabric was used and done, but not anymore. I mean, there's always another piece of fabric on the horizon, huh! Shhhh, don't tell Daddy!